Everyone loves to receive a gift. And God has given us many, such as his grace--the gift we don't deserve and can never earn. Promises from the One who declares we are already loved, already accepted, already created in his image. The question becomes, will we truly receive that gift? Will the reality of it actually change the way we think and notice and reach out? Little did Lucinda Secrest McDowell know that my 'life verse' is John 1:16: 'For of His fullness we have all received, grace upon grace.' In Ordinary Graces, Lucinda has conveyed the strategic importance of looking for and finding God's grace in our everyday lives. His grace does transform our lives. Gently. Tenderly. Wonderfully. The words she has chosen are exquisitely real and important to my life--and yours. Indulge in the grace-filled truth she is sharing. Take it for yourself. 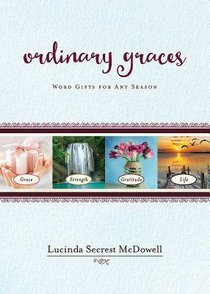 About "Ordinary Graces: Word Gifts For Any Season"
Lucinda Secrest McDowell is an inspirational author and international conference speaker known best for her gift of encouragement. A graduate of Gordon-Conwell Theological Seminary and Furman University, she lives with her family in Wethersfield, Connecticut.